← ‘Deposit a Gift’-A New Way Of Gift Giving-CASH IS KING!! The New York Public Library (NYPL) announced today that Dr. Khalil Gibran Muhammad, a scholar of African-American history from Indiana University, has been selected as the next Director of the Schomburg Center for Research in Black Culture, effective July 2011.
announced his plan to retire after more than 25 years of leadership, having cemented the Schomburg as the world’s leading repository on the global Black experience. The appointment was made by Library President Dr. Paul LeClerc after the unanimous recommendation of a nine-member search committee. Dr. Muhammad, a native of Chicago’s South Side, has served as Assistant Professor of History at Indiana University for five years, where he completed a major interpretive book in African-American studies, The Condemnation of Blackness: Race, Crime, and the Making of Modern Urban America, published recently by Harvard University Press. A great-grandson of Elijah Muhammad, he has deep roots in Black history and in Harlem. His father is the noted Pulitzer Prize-winning New York Times photographer Ozier Muhammad. As an academic, Dr. Muhammad is at the forefront of scholarship on the enduring link between race and crime, that has shaped and limited opportunities for African Americans. “The Condemnation of Blackness renders an incalculable service to civil rights scholarship by disrupting one of the nation’s most insidious, convenient, and resilient explanatory loops: whites commit crimes, but black males are criminals. 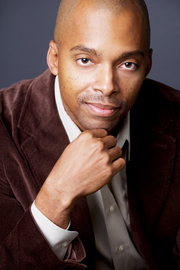 Khalil’s cutting-edge civil rights scholarship, dynamic university teaching, administrative experience, grasp of information technology, and understanding of the Schomburg’s uniqueness will sustain and advance the scholarly mission of this historic institution,” said NYU Professor of History and two-time Pulitzer Prize winner David Levering Lewis. Dr. Muhammad, currently nominated for tenure at Indiana University, is now working on a book-length history of the racial politics surrounding the creation and swift dissolution of Prohibition-era “tough-on-crime” laws, specifically New York’s four-strikes law of 1926. He is also an Associate Editor of The Journal of American History. Dr. Muhammad graduated from the University of Pennsylvania with a B.A. in Economics in 1993. After working at Deloitte & Touche LLP, he received his Ph.D. in American History from Rutgers University in 2004, specializing in 20th-century U.S. and African-American history. He spent two years as an Andrew W. Mellon Postdoctoral Fellow at the Vera Institute of Justice, a nonprofit criminal justice reform agency in New York City, before joining the faculty of Indiana University. Dr. Muhammad is married to Stephanie Lawson-Muhammad, a network operations manager at Verizon Wireless. They have three children, Gibran Mikkel (10), Jordan Grace (8), and Justice Marie (4). The public will have an opportunity to meet Dr. Muhammad at various future events including a community forum. This entry was posted in Harlem, Schomburg Center in Harlem and tagged Black History, Black History and Culture, Schomburg Center in Harlem. Bookmark the permalink.